The Back Bay, located roughly between Massachusetts Avenue and the Boston Public Garden from the Charles River down to the Massachusetts Turnpike, embraces both upscale housing options as well as luxury shopping and commercial enterprises. Whether you’re looking for a favorite book, the latest in fashion, or a relaxing stay in one of the finest hotels in Boston, the Back Bay has everything you want in a location conveniently close to some of the most picturesque housing in the city. The Back Bay takes its name from the fact that it was once literally Boston’s westernmost bay. Once a fishing ground for local Native Americans, the tidewater flats of the Charles River were filled in the latter half of the 19th century to create the Back Bay neighborhood. The Back Bay was designed primarily as a residential zone, though the neighborhood developed rapidly into a center for arts and culture within the city as Copley Square housed the original sites of both the Massachusetts Institute of Technology and the Museum of Fine Arts. Over the years, the southern half of the Back Bay blossomed into a combination of retail stores and restaurants catering to the tastes of not only the residents of the neighborhood but also to the rather more eclectic tastes of students from nearby colleges. 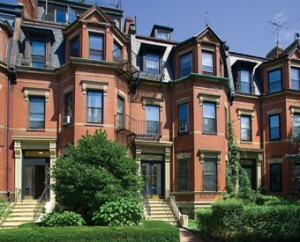 Today, the Back Bay remains one of the most distinctive neighborhoods in Boston, with its rows of brownstones in the north as recognizable as Copley Square or the Hancock Tower. The Back Bay provides one of the starkest architectural contrasts in the entirety of Boston. Victorian brownstones line the streets in the northern, residential, side of the neighborhood, providing The southern side of the neighborhood, on the other hand, is a commercial district featuring many popular shopping destinations as well as luxury hotels including the Lenox Hotel, the Westin Copley Place, and the Boston Marriott Copley Place. As such, the southern side is home to some of the tallest skyscrapers in the city, epitomized by the sixty story high John Hancock Tower at Copley Place.